We started our tour at Castelvecchio, it truly is quite a unique looking castle build from red brick in Gothic style and topped with M shaped merlons around the tops of the walls. 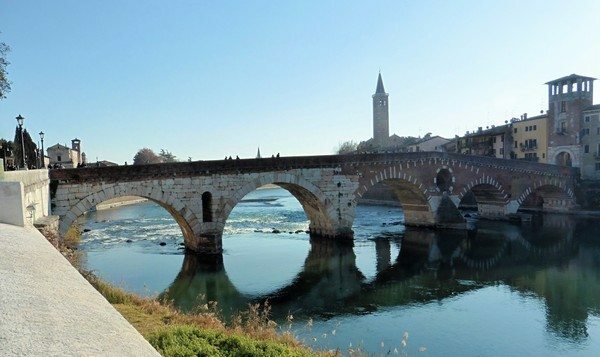 Situated on the banks of the Adige river, and surrounded by a moat, Castelvecchio was constructed by Cangrande II della Scala in 1354. He also attached a fortified bridge across the Adige in case he had to escape to Tyrol where the Austrian part of the family lived. At the time of construction Italy was divided into city states controlled by wealthy families. 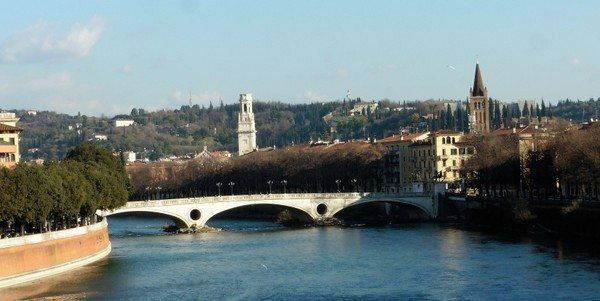 Verona was under threat from the neighbouring states of Venice, Lombardy and Milan. Cangrande II was a cruel tyrant who distrusted everyone. His suspicions were well founded because he was killed by his brother Cansignorio. Under Cansignorio’s reign Verona flourished, an aqueduct, bridges, a treasury and beautiful palaces were built. However, Cansignorio wasn’t a saint. He had his other brother Paolo Alboino imprisoned so that he could rule Verona solely. After Cansignorio’s death in 1375, Paolo Alboino was executed by his nephew Bartolomeo II who wanted sole power over Verona. Bartolomeo II in turn was murdered by his brother Antonio in 1381 and by this stage the citizens of Verona had had enough of the Della Scala’s as the state was bankrupt. 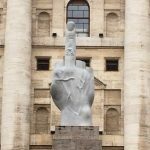 When Gian Galeazzo Visconti of Milan (whom we learnt of in our walking tour of Milan) seized Verona the citizens of Verona wouldn’t support Antonio Della Scala. The citizens were sick of a family who’s most famous exploits was committing frantricide (killing family members). 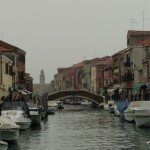 Antonio promptly used his uncles bridge and fled. 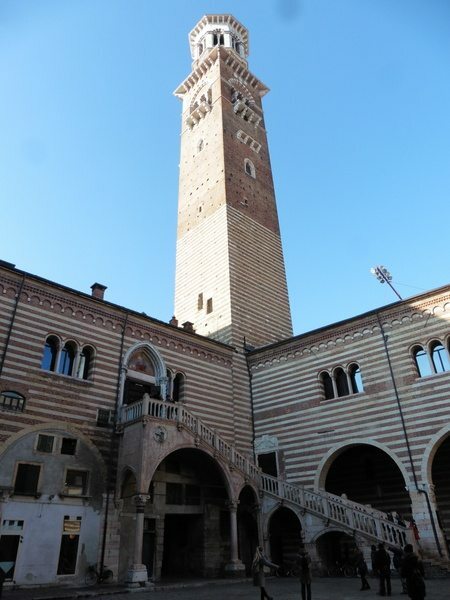 Eventually the Visconti’s were thrown out of Verona by the citizens, but later Verona was absorbed by the Venetians. 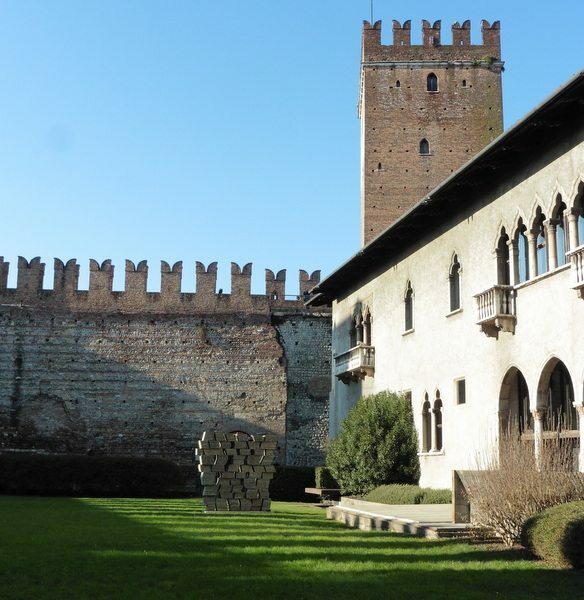 These days Castelvecchio is a museum, which displays a collection of paintings, statues, sculptures, ceramics, ancient weapons, miniatures, and more. Some of the pieces date back over one thousand years. 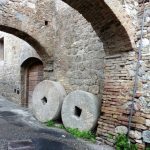 Beside Castelvecchio stands Arco dei Gavi, a 1st century roman gate with cobblestones deeply rutted by the wheels of ancient wagons. It looks out of place as it leads to nowhere except maybe the river. Actually Arco dei Gavi was originally built by the Gavi family on the Roman road. In the Middle Ages the gate formed part of the city walls. 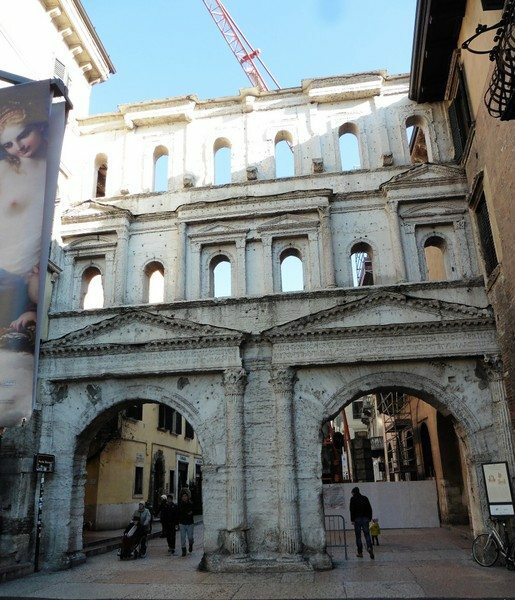 During Napoleons reign the gate was demolished and transferred to the old Roman Arena. When Mussolini rose to power, in the 1930’s, the gate was reassembled next to Castelvecchio. It was part of his fascist ideology to link the fascists to the power of Ancient Rome. However, in its location, next to Castelvecchio, it looks a little out of place. 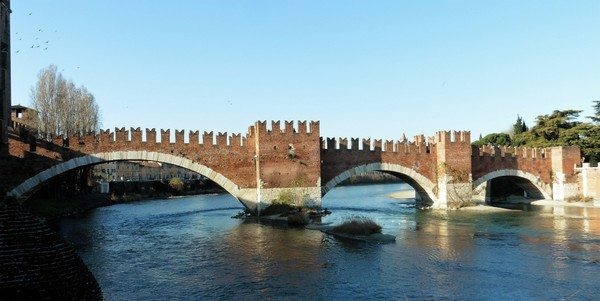 From Castelvecchio we were able to access Ponte Scaligero or Castelvecchio Bridge as it’s also known. Built from red brick, it also features M shaped merlons on either side as a defensive feature which actually blends in with the castle. From the bridge there are great views along the tree lined river Adige. On one side is the older buildings of the old city whilst on the far bank are the newer buildings of the 20th century. 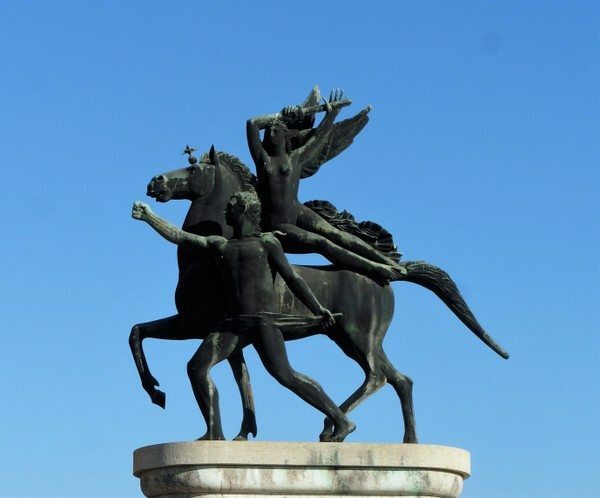 Not far from Castelvecchio is Ponte Della Vittoria (The Bridge of Victory) which was built in the early 1930’s to commemorate Italy’s victory over the Austro-Hungarian Empire in WW 1. 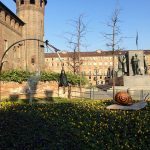 It has some great statues at either end, plus great views back along the river to Castelvecchio bridge. Not far from Ponte Della Vittorio is Porta Borsari (Borsari Gate). It too is a Roman gate dating from the 1st century. Porta Borsari was built on Via Postumia, the main Roman road which led from Genoa. It’s a fascinating structure with two archways on the bottom level to allow access. 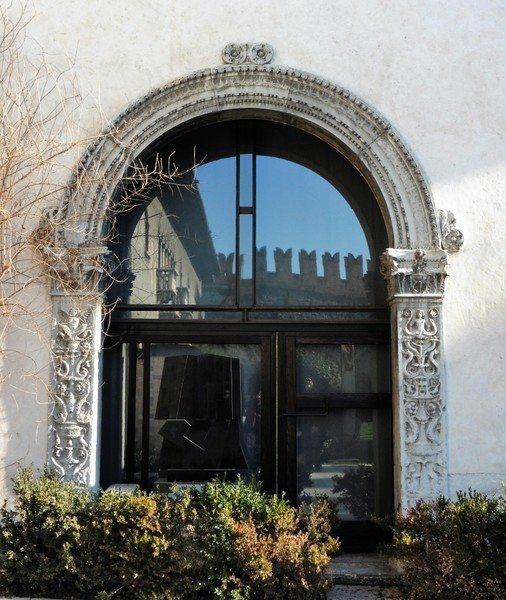 Built from local limestone the gate features also has two upper levels featuring six arched windows on both levels. The old Roman road is now beneath Corso Porta Borsari, a pedestrian street, which leads towards the centre of the old medieval city. Either side of the street are lined with old buildings which feature balconies draped with vines and plants. It’s really quaint. The old buildings are home to shops, cafe’s and restaurants. The corso leads to Piazza Delle Erbe a vibrant square in the centre of the old city. 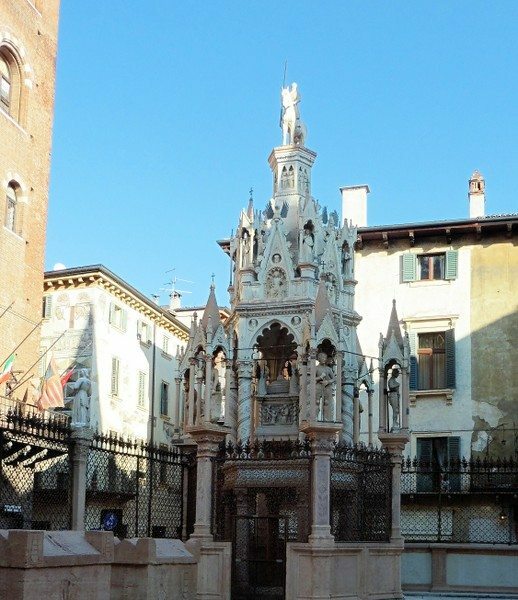 At the top of Piazza Delle Erbe is a Roman style column on top of which sits Il Leone Marciano (the lion of St Mark). It’s the symbol of the Venetian republic which of course controlled Verona after the dispersal of the Della Scali family. The very same winged lion also features on many buildings along the Croatian coast. 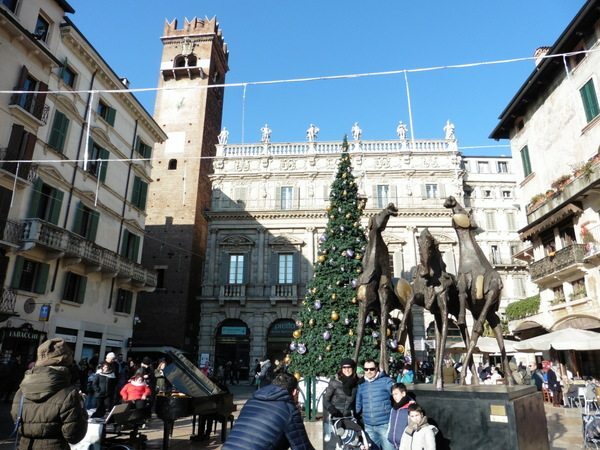 Piazza Delle Erbe was alive with Christmas markets selling all sorts of food, gifts and souvenirs. A pianist was plunking away on a baby grand piano in the middle of the square with a huge crowd looking on. Around the square all the restaurants and cafe’s were packed with people soaking up the sun. 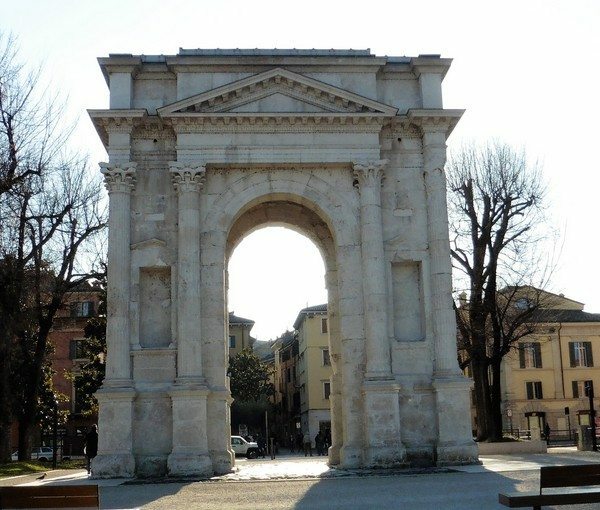 The gateway known as Arco Della Costa led through to Piazza Dei Signori. It featured a whale bone hanging beneath it. Legend has it that the whale bone will fall when the first person passes beneath it who has never told a lie. It’s been up here for 1000 years but weren’t taking any chances and entered the piazza from another entry. The piazza is surrounded by lots of palaces some which now house restaurants and also the gallery of contemporary and modern art. 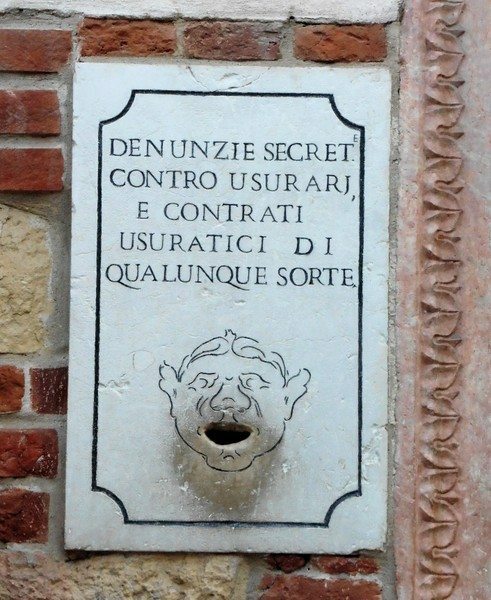 On one of the walls a face with an open mouth invites people to dob in unscrupulous traders by leaving a message in their mouth. obviously someone has been ripped off for their were a number of messages. Near the museum the Torre Dei Lamberti overlooks the city. It dates back to the 12th century and it’s bells were used to signal fires, time and emergencies. These days it’s open to the public to climb if you have the energy to do so. Just past Piazza Dei Signori is Cansignorio Della Scalla’s tomb. It is quite an elaborate Gothic tomb. The surprising part is that the family which had such a history of murdering family members would go to all that trouble of building such an elaborate tomb. 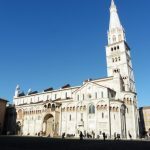 The tomb with its gothic spires reaching for the sky is in the courtyard of Chiesa Santa Maria Antica. The church is a tiny church divided into three areas by rows of columns either side of the nave. Around the Santa Maria chapel the walls are adorned with hundreds of votives. In the central altar sits an early bishops chair carved from a single block of brown marble with eagles carved into either arm. The exterior of the church is quite simple because it was never covered in marble cladding. Inside however no expense was spared. The floors are covered in brown, white and black marble in various patterns, from checker works to a rose pattern in front of the altar. The various chapels which surround the nave are decorated in marble and feature hand painted statues of different saints. Two of the features which are a highlight of the church are the hunchbacks holding up the holy water. The vaulted ceilings feature elaborate decoration with black and white marbled arches. 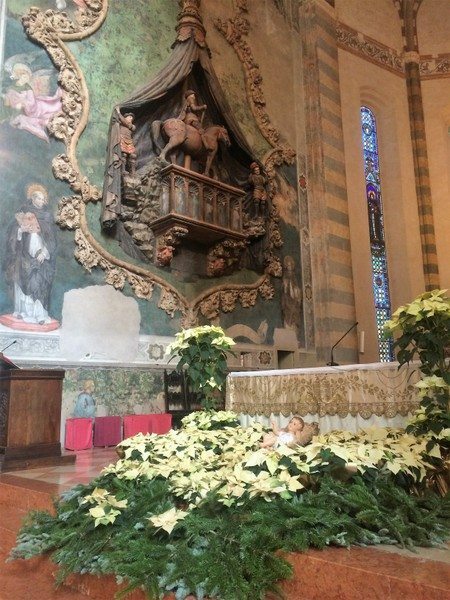 On the left of the apse is the tomb of Cortesia Serego with a statue of him riding a horse. It’s quite an odd addition. The church really is exquisite and you really have to admire the craftsmen who created such art. On Piazza Sant Anastasia is the former church of San Pietro Martire. It was also built by the Dominican friars. During the Napoleonic reign the church was used as stable for horses of troops. The murals on the wall show the signs where fires were started by soldiers to keep warm. They were also plastered over and the murals all have various holes in them where the plasterers “keyed” the walls prior to plastering. Above the gate to the convent is the tomb of William Azzone Castelbarco dating from 1321. His tomb inspired the Scalla family to outdo him in style. From Piazza Sant Anastasia the road leads to the Duomo past more lovely shops. 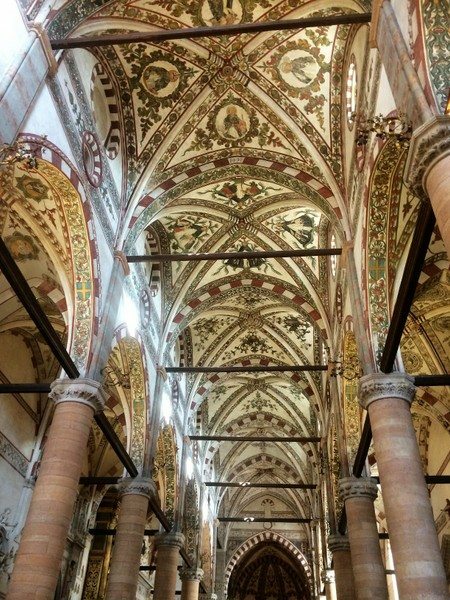 The Verona Cathedral was built over two early Christian churches which collapsed after the earthquake of 1117. 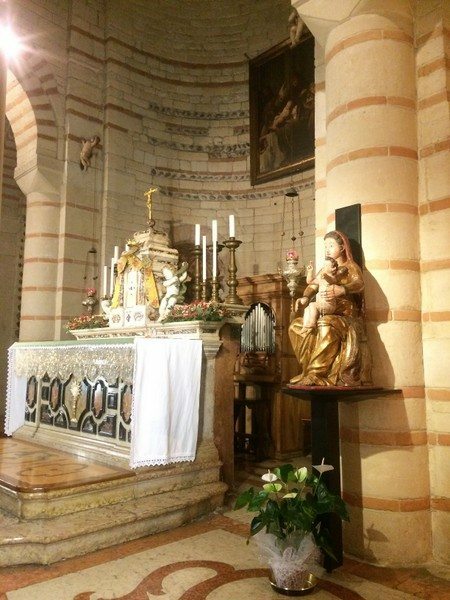 After the earthquake work started on a Romanesque cathedral, and seventy years later the duomo was consecrated. Entering the duomo is via the rear which features a baptistery separate from the cathedral. 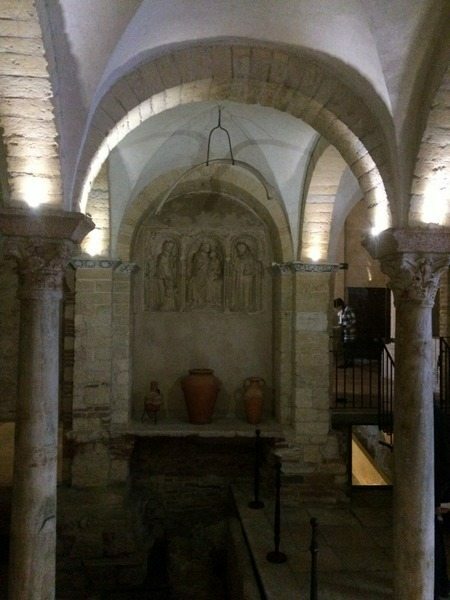 The baptistery is the size of a small church and features a large octagonal baptismal font. It’s probably as big as your standard spa bath with carved marble statuettes around the bottom. Obviously they have big families here judging by the size of the baptistery. Also at the rear the foundations of the early church are visible through glass floor panels. Inside the cathedral the floors are covered in brown black and white marble in various designs including the crests of the royal family. The cathedral had a beautifully decorated ceiling also and lots of beautiful craftsmanship around the chapels. 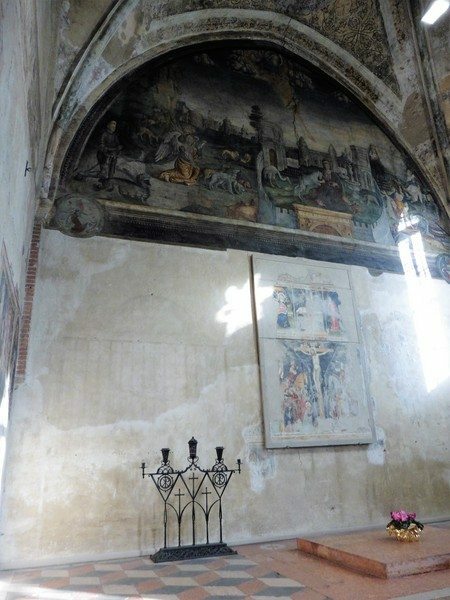 The ceiling of the apse featured frescoes of various religious figures which were almost cartoon like. 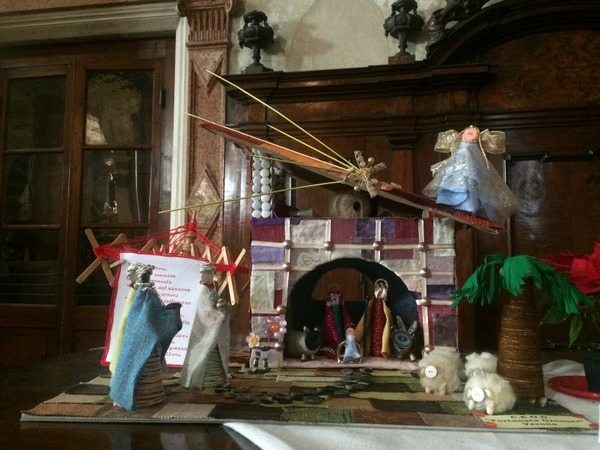 However, the highlight was all the different nativity scenes built by various groups from Verona and on display. 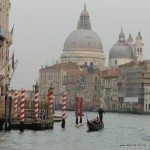 It was way past lunchtime by the time we left the Verona Cathedral and we headed towards Ponte Pietra with the plan of having lunch nearby. Ponte Pietra was built by the Romans around 100 BC and provided access to the theatre on the opposite riverbank. The bridge was partially destroyed by retreating troops during WWII and the evidence of the repair is still quite visible. After a quick walk around the opposite bank looking for a restaurant we retreated back across the Ponte Pietra. 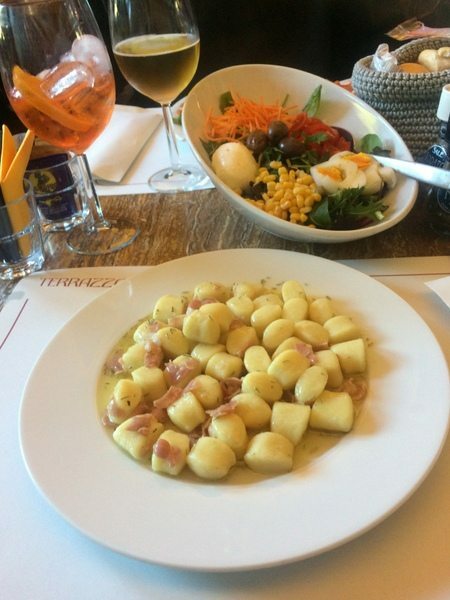 A number of restaurants lined the street and we found a nice spot at Terrazza Bar Al Ponte. They have a beautiful terrace where you can enjoy views of the bridge. The staff were really friendly, prices reasonable, good freshly cooked food…..what more can you ask for. The streets around Ponte Pietra are filled with a mixture of medieval and renaissance buildings. They are home to boutique shopping, cafe’s, restaurants and housing. Via Ponte Pietra also lead back towards Via Duomo where we retraced our steps back past Piazza Sant Anastasia to Chiesa Santa Maria Antica. At the rear of the church Via Arche Scligeri is Casa Di Romeo. Yep one half of Shakespeare’s most famous couple. High walls surround the mansion. 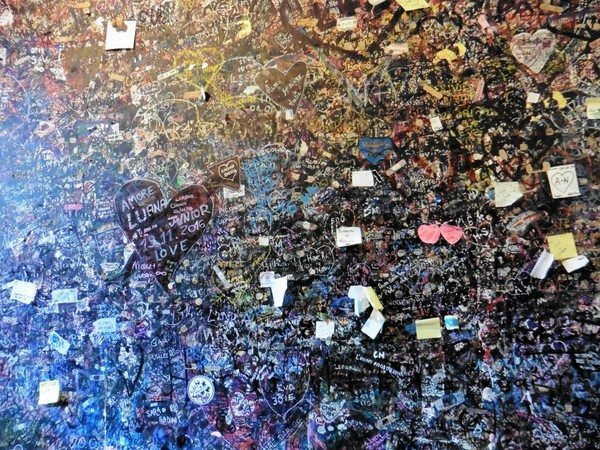 On the walls lovers have scrawled messages of love and devotion in various colours of ink. It’s so romantic. Casa Guilietta the supposed home of the other half of the romantic duo is only streets away just below Piazza Delle Erbe. Casa Guilietta dates from the 13th century and the family crest of Dell Capello still graces the wall. On the walls of the gateway leading to the courtyard of Casa Guilietta tourists also scrawl messages of love and devotion. At a souvenir shop in front of the courtyard tickets to a balcony which overlooks Juliet’s balcony are on sale. 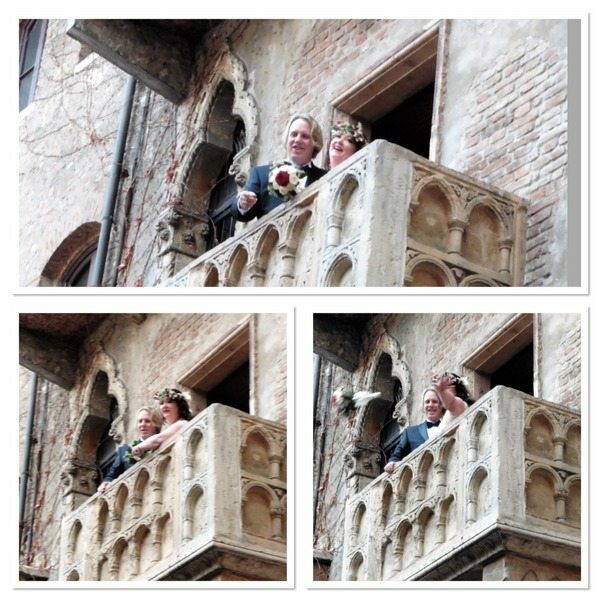 Juliet’s balcony is quite popular with newly weds and we witnessed a bride tossing her bouquet into the moshpit of people below. The balcony supposedly is a twentieth century addition as is the bronze statue of Juliet. Many people rub the right breast for luck. It could be for luck or maybe they are just perves just looking for an excuse. Around Piazza Delle Erbe signs pointed to the Teatro, of course along Via Mazzini the upmarket shopping area of the old city. It was absolutely packed with people all dressed up to the nines. Italians love their fashion and they love shopping. Via Mazzini is so posh it’s even is paved with marble. There were stores so exclusive I hadn’t even heard of them before. Via Mazzini led back to Piazza Bra the site of Arena di Verona (the roman amphitheatre). The amphitheatre dates from the 1st century and had a capacity of 30,000 people. 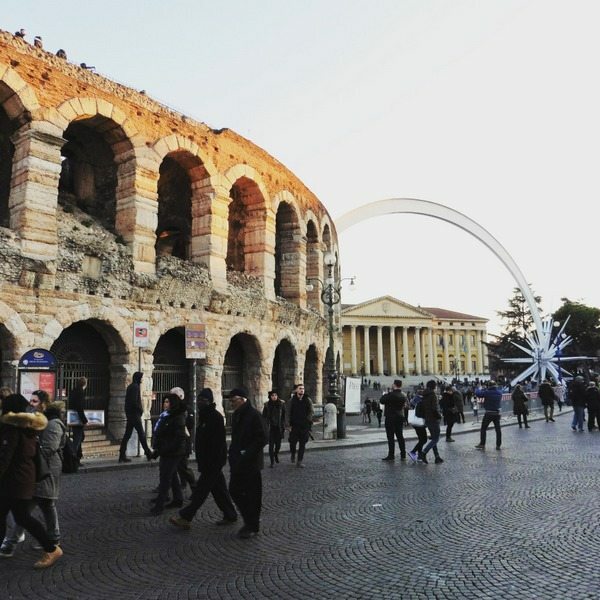 The earthquake of 1117 which destroyed many of the buildings of Verona also damaged the amphitheatre. In the city’s rebuilding process the red and white limestone from the amphitheatre was quarried for building. These days it’s used for classical music concerts, rock concerts and its probably easier to work out who hasn’t played there rather than who has. It’s also open for visits but as it was almost dark and we’ve seen quite a lot of Ooman amphitheatres we gave it a miss. After a big day walking around Verona it was time to take a well earned rest. We found a bar near where our bike was stored and played celebrity head using bar coasters. It was a nice little locals bar where drinks were cheap and locals friendly. As we picking the bike up from Olga and Andreas we still had a few hours to kill. 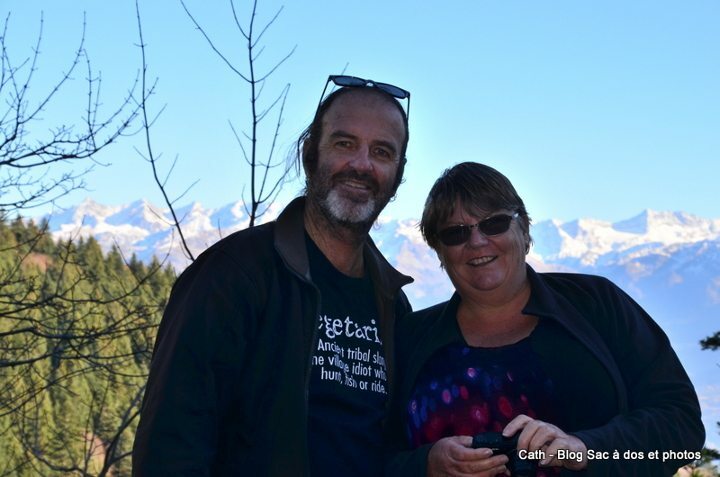 They are couchsurfers who have kindly housed our bike for us whist we were in Austria. It was really nice as we only met them briefly when we dropped the bike off. 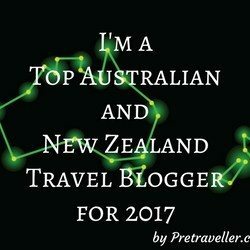 This time they also invited us for dinner so we had a chance to chat over a bottle of wine. After being stuck in a cold basement for so long the bike was a but cold starting but not as cold as the streets gong back to the hotel. I felt sorry for the streetwalkers out drumming up business near the hotel. 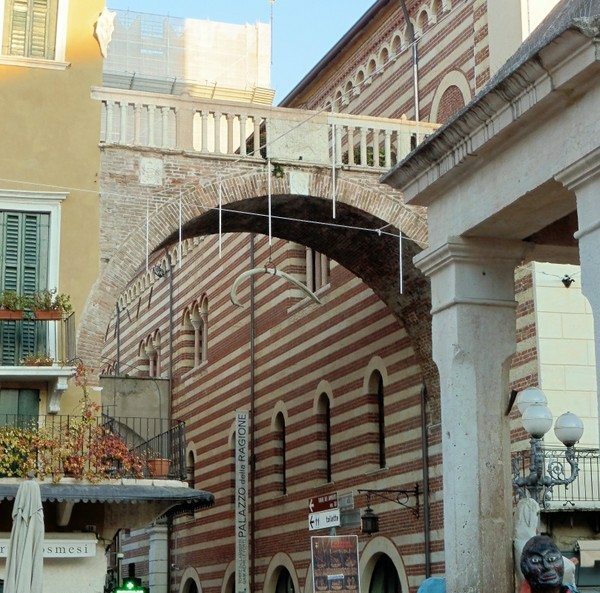 It seems some locals of Verona no longer stand under balconies singing love songs.